Board Certified Clinical Specialist in Sports Physical Therapy Penny completed a Bachelor of Science in Kinesiology degree with an emphasis in athletic training and a Master of Arts degree in Physical Education with an emphasis in Biomechanics from San Diego State University in 2001 and 2004, respectively. Penny earned her doctorate in Physical Therapy from the University of Saint Augustine in 2012 and completed a American Physical Therapy Association credentialed Sports Residency in 2014. She is an active member of the American Physical Therapy Association and a credentialed clinical instructor. 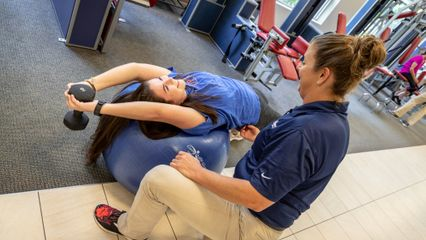 She has published on topics including returning to sports after Anterior Cruciate Ligament Reconstruction and fear of movement/re-injury across the spectrum of outpatient physical therapy diagnoses. Outside of the clinic, Penny enjoys traveling, concerts, and working out. Jerry earned his Physical Therapy degree from the University of East Ramon Magsaysay Memorial Medical Center in the Philippines. He is a National Strength and Conditioning Association Certified Strength and Conditioning Specialist, as well as a Lifestyle and Weight Management Consultant and Certified Personal Trainer via the American Council on Exercise. Jerry has an extensive collection of sneakers and enjoys cultivating his garden and raising his animals alongside his wife and children.